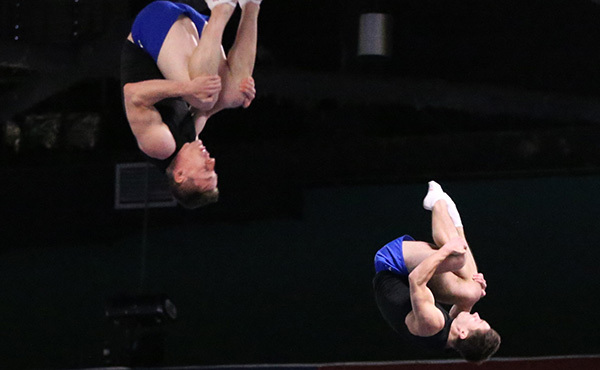 Jeffrey Gluckstein of Atlantic Highlands, N.J./Elite Trampoline Academy, and Aliaksei Shostak of Youngsville, La./T&T Express, landed in fourth place in the synchronized trampoline final at the Minsk (Belarus) World Cup. Laura Zeng of Libertyville, Ill./North Shore Rhythmic Center, placed sixth in the ball and eighth in the clubs finals at the World Cup at the Gymnastics Sports Hall in Tashkent, Uzbekistan. 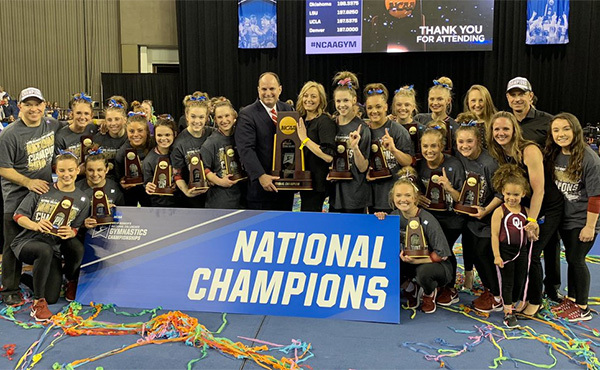 The University of Oklahoma put an exclamation point on its 2018-19 season by winning the team title, giving them an undefeated season of 32-0, at the 2019 National Collegiate Women’s Championships at the Fort Worth (Texas) Convention Center Arena. 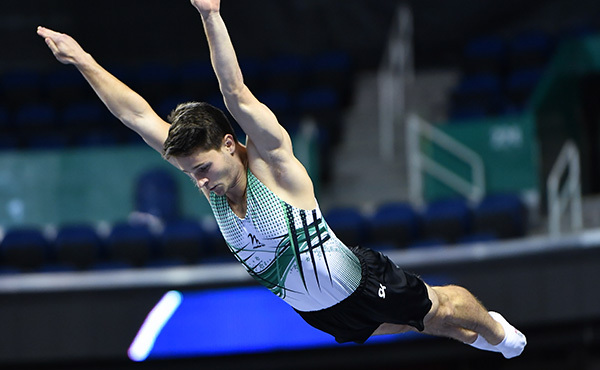 Competition at the Minsk (Belaurs) World Cup at the Minsk Arena concludes Sunday with synchronized trampoline qualification and finals, plus the finals for individual men’s and women’s trampoline. 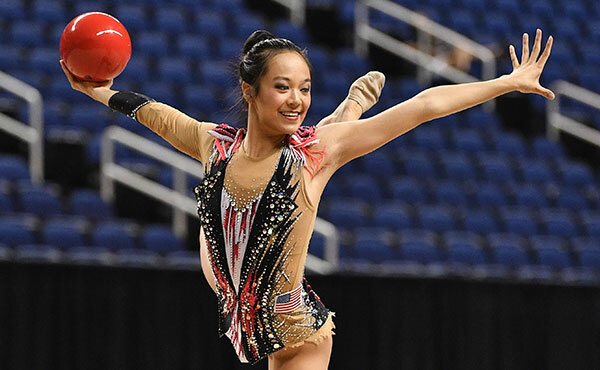 Laura Zeng of Libertyville, Ill./North Shore Rhythmic Center, will compete in both the ball and clubs finals tomorrow at the World Cup at the Gymnastics Sports Hall in Tashkent, Uzbekistan. 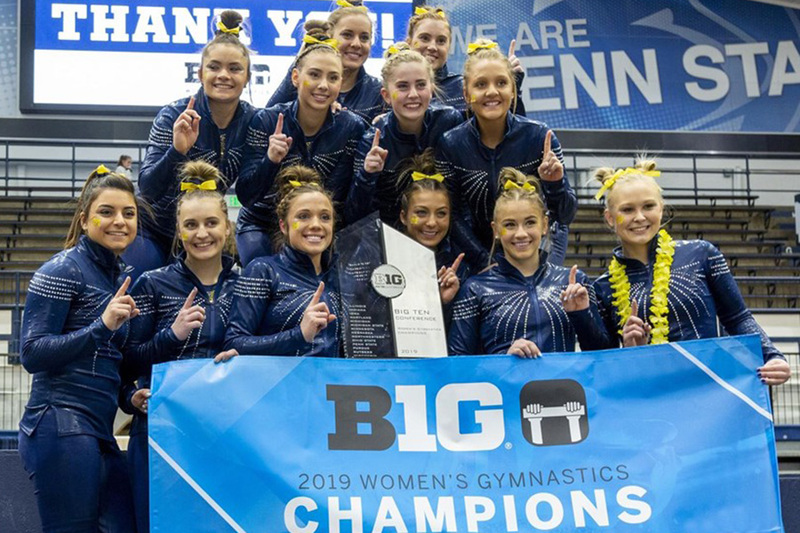 STATE COLLEGE, Pa. -- The University of Michigan women's gymnastics team won the Big Ten Championship for the sixth consecutive year and 25th time in school history on Saturday (March 23) at Rec Hall on the campus of Penn State University. NORMAN – Make that eight consecutive Big 12 titles for the Oklahoma Sooners. 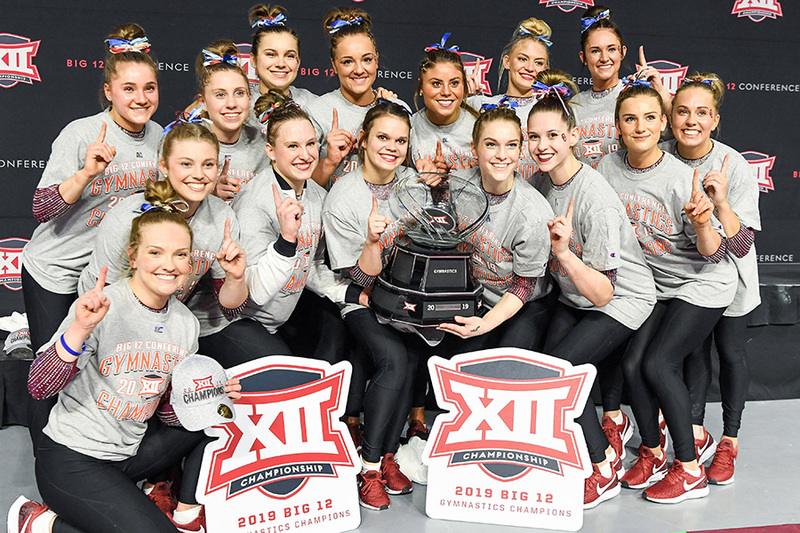 Top-ranked Oklahoma recorded a 197.575 to take the 2019 Big 12 Championship on Saturday inside Lloyd Noble Center. 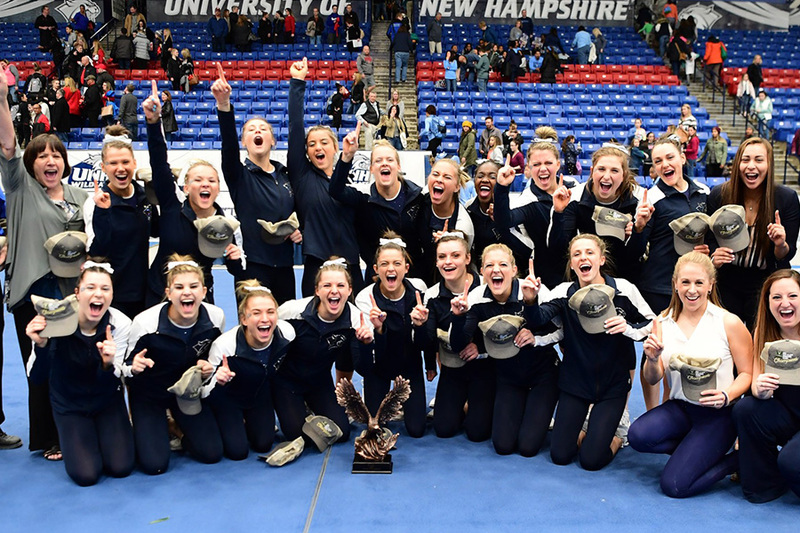 DURHAM, N.H. – The University of New Hampshire gymnastics team won the third EAGL Championship in school history at the same place it won in 2003 and 2014, the Whittemore Center, before a crowd of 2,216 on Saturday. 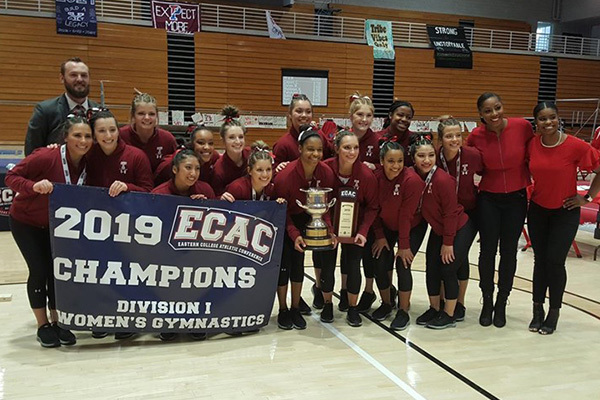 ITHACA, N.Y.—Temple women's gymnastics (19-14, 8-1 ECAC) made program history in more ways than one this afternoon, as the team won its first ever ECAC Championship, set a new beam program record and had three gymnasts and two coaches win ECAC awards. 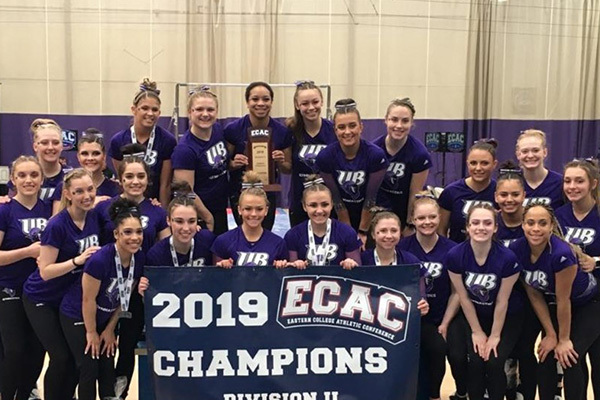 BRIDGEPORT, Conn.-The University of Bridgeport women's gymnastics team took home its eleventh straight ECAC Division II title on Saturday afternoon at home in the Wheeler Recreation Center, as the Purple Knights posted a team score of 195.150 to top West Chester University and Southern Connecticut State. 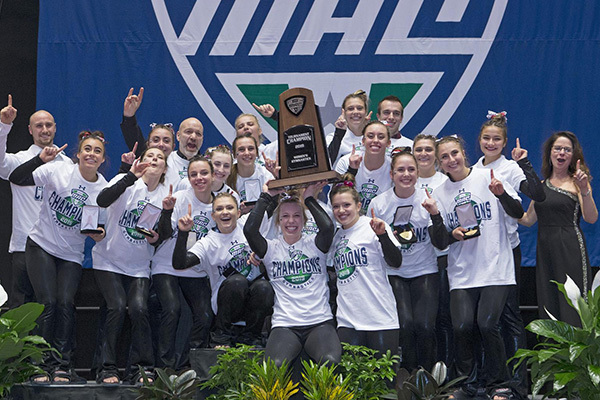 DEKALB, Ill. – All that stood between the Northern Illinois University gymnastics team and its first Mid-American Conference Championship was a beam of wood four inches wide that stood four feet off the ground. 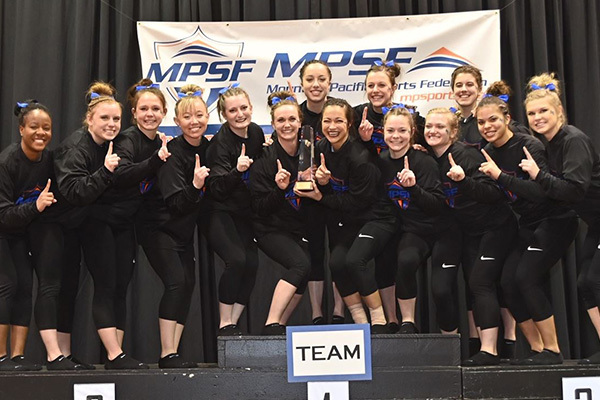 SEATTLE, Wash. - The Air Force women's gymnastics team posted a 195.725 team score to win its first-ever MPSF Championship title, setting a new Academy team score record and the third-highest mark by any MPSF championship team. 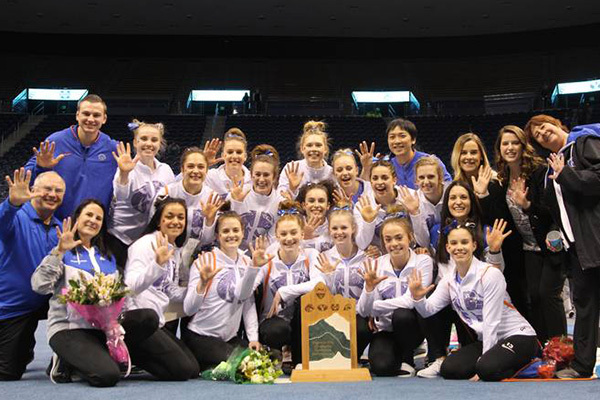 PROVO, Utah – The 13th-ranked Boise State gymnastics team, even without its most-decorated gymnast in school history, captured a fifth-consecutive Mountain Rim Gymnastics Conference Championship Friday at the Marriott Center, recording a 196.950 – more than a full point clear of No. 24 Southern Utah (195.900). WEST VALLEY CITY, Utah - No. 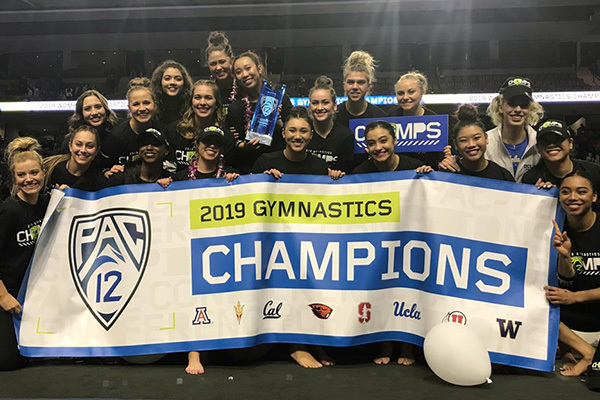 2 UCLA posted a Pac-12 Gymnastics Championship record and season-high 198.400 to capture its 19th Pac-12 title. 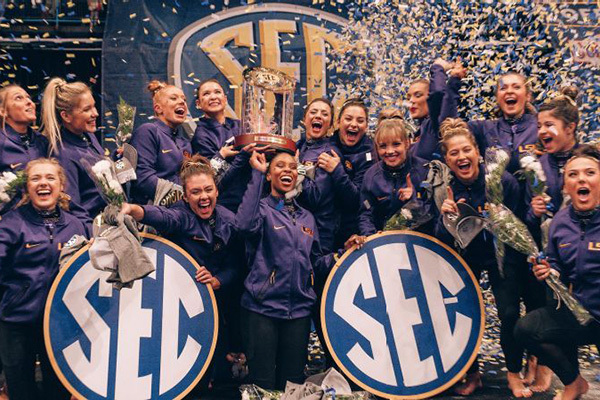 NEW ORLEANS - The third-ranked LSU gymnastics made a furious comeback in the final rotation to capture its third-straight Southeastern Conference championship with a team score of 197.900 Saturday night inside of a raucous Smoothie King Center. 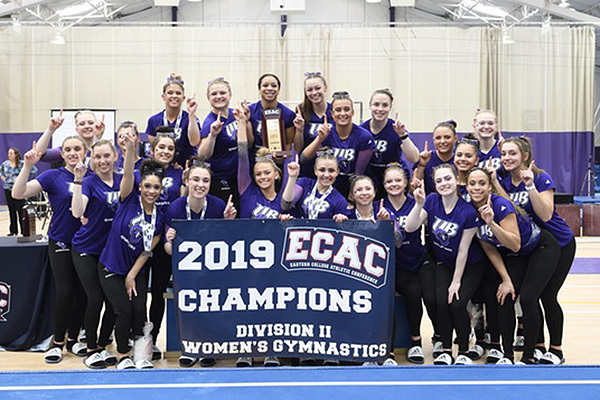 OSHKOSH, Wis. – At the 2019 National Collegiate Gymnastics Association (NCGA) National Championships, The College at Brockport secured their first title since 2012 on Saturday, posting a team score of 191.050 to bring home the victory. 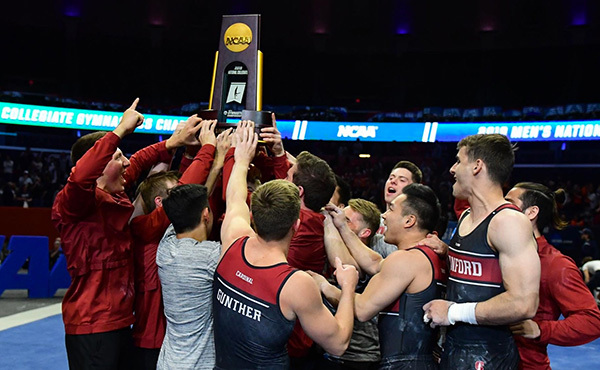 BERKELEY – Punctuated by Aaron Mah's hit on his final high bar routine, California fought through a loaded field headlined by the reigning national champion Oklahoma and UIC, to make its case during a night that celebrated four seniors. LINCOLN, Neb. - The Nebraska men’s gymnastics team claimed three event titles at this afternoon’s senior day meet, topping the No. 3 Michigan Wolverines. COLUMBUS, Ohio — Emotions ran high as the No. 9 Ohio State University men’s gymnastics team entered St. John Arena for the final time on Sunday, and the team responded with a comeback victory over No. 4 University of Illinois Fighting Illini, 406.600-404.000, to cap senior night off with a victory on Sunday. MINNEAPOLIS - The No. 6 Minnesota men's gymnastics team needed a huge performance at Maturi Pavilion to pull off the meet victory on Saturday against No. 5 Penn State and No. 8 Iowa. USAF ACADEMY, Colo. – Backed by five event titles and a 1-5 sweep of the still rings standings, the 13th-ranked Air Force men's gymnastics team closed out the home portion of its 2019 campaign this evening (March 23), with a decisive 396.100-378.750 victory over 17th-ranked Washington at the Academy's Cadet West Gym. FAIRMONT, W.Va. -- Fairmont State scored a 9.50 or higher in 12 heats and rolled to a 273.370-261.730 victory over Glenville State on Wednesday evening at Joe Retton Arena. PHILIPPI, W.Va. -- The Alderson Broaddus acrobatics & tumbling team sent their seniors out in style with a 254.565-215.665 victory over visiting West Virginia Wesleyan Wednesday night inside Rex Pyles Arena. URBANA, Ohio - The Urbana University Acrobatics & Tumbling team fell to Georgetown College, 173.495-130.625, in the Blue Knights' first ever official home meet Friday night. MARSHALL, Texas – Coming back home after being on the road since the end of February, the East Texas Baptist University acrobatics and tumbling team came up short of a win against Concordia University-Wisconsin, 224.795-207.580. GLENVILLE, W.Va. – The GSC Acrobatics & Tumbling team earned their fourth victory of the season on Sunday as they defeated the Bulldogs of Adrian College. USA Gymnastics is the National Governing Body (NGB) for the sport of gymnastics in the United States, consistent with the Ted Stevens Olympic & Amateur Sports Act, the Bylaws of the United States Olympic Committee and the International Gymnastics Federation. 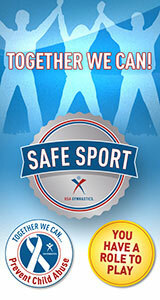 The mission of USA Gymnastics is to encourage participation and the pursuit of excellence in all aspects of gymnastics. 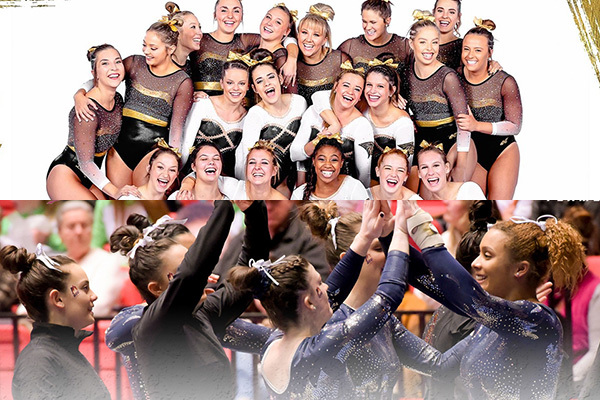 Registering a username and password on USA Gymnastics gives you access to new and upcoming features within our website. By registering you will have access to membership features which will let you update or renew your membership. Register today by clicking below on the link!